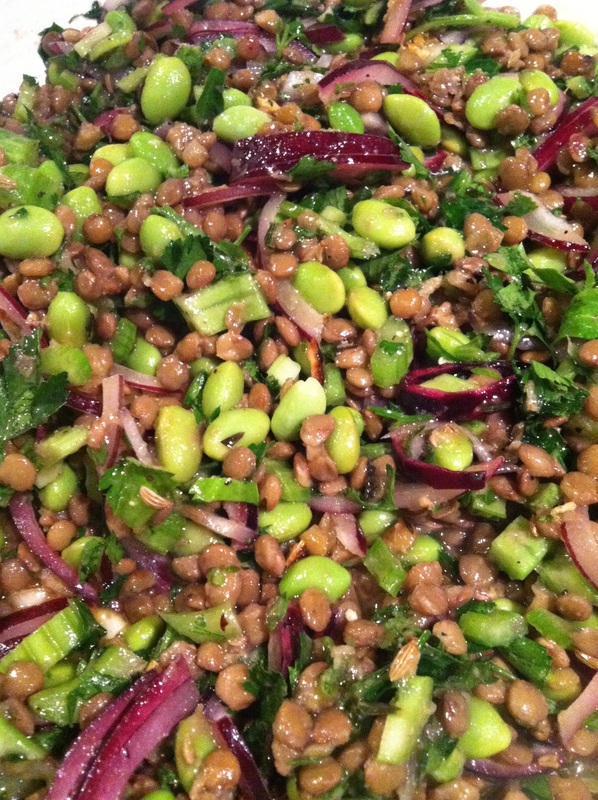 I had lentils, edamame, parsley and extra-firm tofu that needed to be used up. So in my continued efforts to experiment with tofu, I came up with this yummy flavor combination that can be prepared ahead of time and then finished quickly on the day you want to serve it. I loved the different textures in this dish; the creaminess of lentils, firmness of edamame and soft, yet firm tofu came together nicely. Tarragon and fennel are not herbs I typically use. Since I, of course, started with another recipe that called for tarragon and fennel I went ahead and tried it out. I think I like tarragon! It has a strong flavor, almost lemony, so experiment with how much you use. Marinate the tofu. 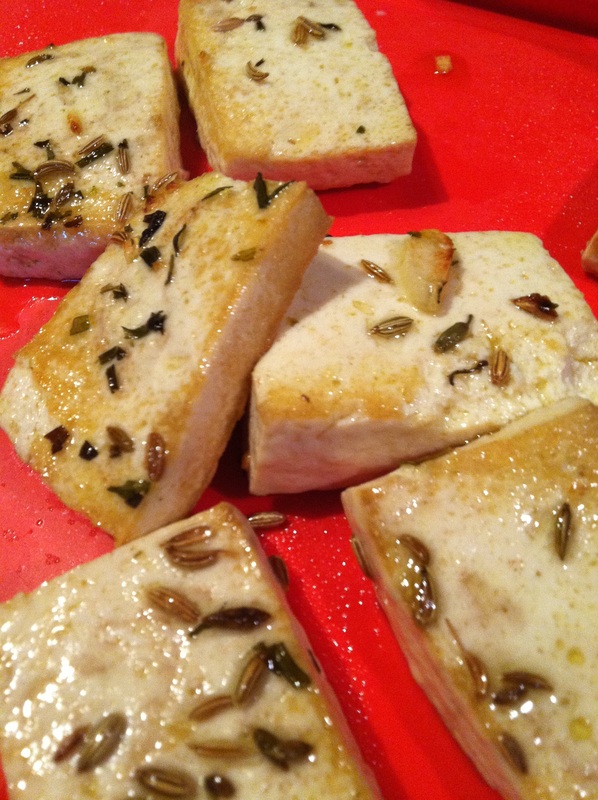 Slice tofu into squares. Mince the garlic. 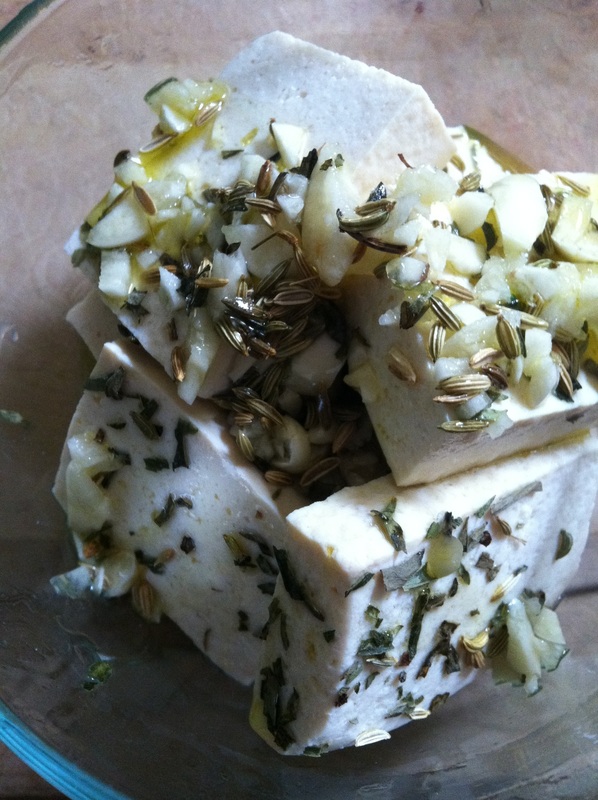 Place tofu, garlic, fennel and tarragon in a glass container. Drizzle with olive oil. Cover and refrigerate until ready to use. Make the lentils. Cook lentils or drain and rinse canned lentils. Mince the garlic and chop the onion, celery and parsley. Mix all the ingredients for the lentils together. Season as you like with salt and pepper. Store in a glass container until ready to use. Fry the tofu. Place a medium to large size skillet over medium-high heat. Ensure that each piece of tofu has a little bit of olive oil coating it from the marinade. Place each piece of tofu in the warm pan. Turn over and cook until each piece is browned. Remove the tofu from the pan and place on a plate. Warm the lentils. Add the lentils to the pan you used for the tofu. Mix around until the lentils are warmed through. If you would rather have onions that are cooked through, keep the onions separate in step 2, saute them after the tofu is cooked, and then add the lentils. Serve the lentils with a few pieces of tofu on the side. Balance out the meal with a lovely salad. This looks great! 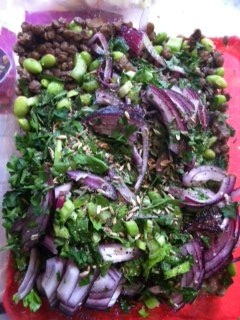 Really colourful and I love the way youve marinated the tofu so there will be little bursts of flavour with the seeds! I’m really liking marinating tofu-it’s so easy to use the flavors from the dish you are making to marinate the tofu and then you’ve got a super-flavorful meal! Glad you liked it!